Our Beautiful Red Steampunk Corset. Light boning to create an hourglass shape. Side hook and eye closures. Lace up back for greater adjustability and a wide range of sizing. Modesty panel at the back. Take over the night with our Victorian Women's Steampunk Lace Up Brocade Steel Boned Red Corset worn with jeans or costume. 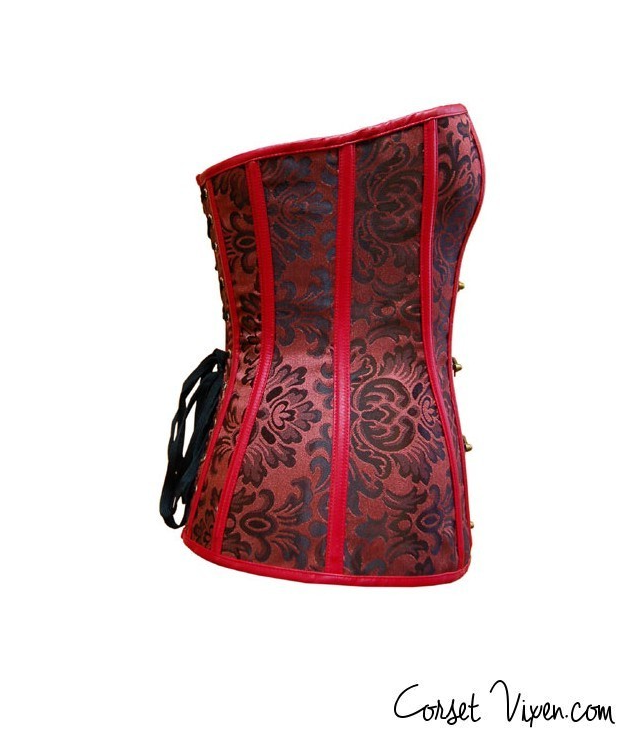 This gorgeous red steampunk steel boned overbust corset finished with brass buckle clasps is a staple for every woman. We highly encourage that a natural waist measurement is made before ordering to determine your correct corset size. (This is not your waist size for jeans). Please call us or email us if you are unsure of your corset sizing. We will give you a free consultation.